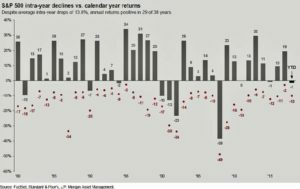 After nine consecutive quarters of positive returns, the US stock markets delivered a negative return in the first quarter of 2018, as the S&P 500 declined over 1% and the Dow Jones fell over 2%. 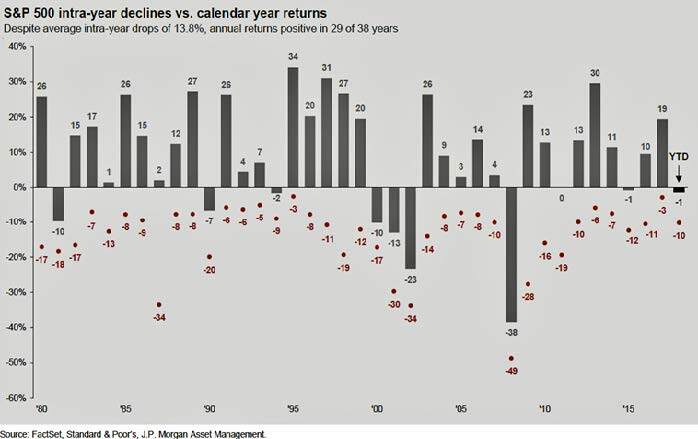 It was a modest decline, but a good reminder that stock markets can and do go down from time to time. International stocks were mixed. The broad-based MSCI EAFE index of companies in developed foreign economies declined over 2% in the recent quarter. Emerging market stocks were the lone bright spot, as the MSCI EAFE EM index gained nearly 1% in dollar terms in the first quarter. In the bond markets, interest rates on the 10-year US Treasury bond continued a slow but steady rise, finishing the quarter yielding 2.75%, up from 2.40% to start the year. The February – March period resulted in the first correction – that is, a decline of more than 10% – in two years, which erased a roaring start to the year. Market commentators point to many proximate causes for the stock market decline, from chaos in the White House to the possibility of a global trade war to fears of inflation or higher interest rates to the simple fact that U.S. stocks have been priced much higher than their historical averages. Meanwhile, the economic data continues to be robust. The unemployment rate is testing record lows, and new jobs are being created at record levels. More importantly, annual earnings estimates for S&P 500 companies rose 7.1% during the first three months of the year—the fastest quarterly rise since 1996. Over time, corporate earnings are the key driver of stock market returns. The pickup in stock market volatility is noteworthy. Over the past three months, the CBOE Volatility Index–the VIX index–widely known as Wall Street’s “fear gauge,” posted its most significant quarterly rise since the third quarter of 2011, jumping 81%. The VIX reflects option traders’ collective expectations for the S&P 500 index’s volatility over the coming 30-day period, and by this measure, traders had been very calm for the 18 months before early February. Now the VIX is at or near its historical average, which suggests that the equity markets are going to experience a more normal bumpy ride going forward. Our Q4 investment commentary highlighted rising interest rates and the attractiveness of emerging markets, two themes that played out in the first quarter. Our Q3, 2017 investment commentary discussed the unwinding of the Federal Reserve balance sheet and how this would likely trigger greater volatility in financial markets. The latest factor to emerge as an influence on the stock market and the economy is the growing threat of a trade war, a topic that deserves further discussion. President Trump was elected on a populist agenda, and after much rhetoric, the administration has turned the war of words on trade into sizable action. The initial salvo came in early March when Trump announced tariffs on steel and aluminum imports to the US – a move that surprised his staff and prompted the resignation of his top economic advisor. Weeks later, President Trump escalated the trade war, declaring that America’s trade deficit with China, “the largest deficit in the history of our world” is “out of control” and “a tremendous intellectual-property theft situation.” After laying out his concerns, he announced plans for litigation against China at the World Trade Organization (WTO). And while Trump has a propensity to overstate facts (such as frequently claiming a trade deficit with China greater than $800 billion, when in fact it is closer to $400 billion), the case against China’s unfair trade practices does not require exaggeration. Unlike with steel and aluminum tariffs, many economists see merit in Trump’s trade case against China. Even free trade economists and internationalists agree China’s predatory trade practices—which include forcing US business to transfer valuable technology to Chinese firms and restricting access to Chinese markets—are undermining both its partners and the trading system. President Trump’s trade proposals against China are risky, but they are on firmer legal, political and economic ground than most of his complaints. The classic case for free trade predicts that each country specializes where it has a comparative advantage, lowering costs and raising incomes for everyone. If China subsidizes exports of steel to the US, in theory, the US still benefits because consumers and steel-using industries will have lower costs, and while some steel jobs will disappear, more productive jobs elsewhere will take their place. But starting in the 1980s, economists recognized that comparative advantage couldn’t explain success in many industries such as commercial jetliners, microprocessors, and software. These industries have high barriers to entry. In such industries, a handful of firms – many American – have established dominant positions, reaping what economists call “rents.” Chinese trade policies are aimed at supplanting these American firms and achieving such dominance for Chinese firms in many of these industries by 2025. The US does not stand alone in its complaint against China’s unfair trade policies; ire at China’s practices is widely shared by other countries. French President Emmanuel Macron has called for a unified European Union policy against Chinese corporate takeovers. “Everyone who trades with China faces this problem,” Peter Navarro, Mr. Trump’s trade adviser, stated when the World Trade Organization (WTO) actions were first announced. “Part of the process that we’ve undergone is to have a significant outreach to our like-minded allies and trading partners.” The US hopes that other countries join its complaint to the WTO, which states that China unfairly treats foreign companies that license their technology to Chinese entities and uses contracts that discriminate against foreign technology. The trade dispute is escalating as China recently announced a series of tariffs on US goods. China’s move was in response to the Trump Administration’s actions and matched the scale of proposed US tariffs. And while the US and Chinese announcements are only proposals at this point, both sides are taking a hardline approach. 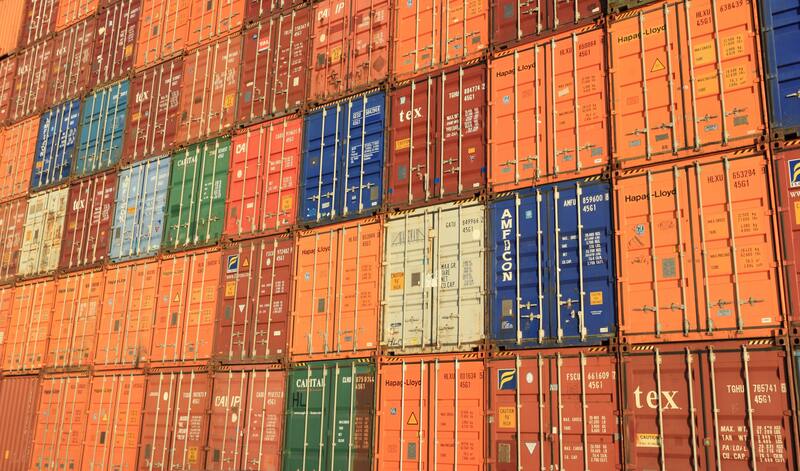 The US is allowing 60 days for public feedback and hasn’t specified when the tariffs would take effect, leaving a window open for talks between the two countries. Economists are currently estimating that this trade dispute could take half a percentage point off GDP growth this year, while also causing a 0.3% further increase in inflation. The inflationary implications would likely put more upward pressure on interest rates. We hope that the trade dispute does not escalate into a full-blown trade war between the US and China, and we will continue to monitor the situation closely.